—Augustus Saint-Gaudens (1848–1907), his reply to complaints from committee members that he was taking too long to complete the Shaw Memorial Monument. “The Shaw Memorial,” plaster, National Gallery of Art, Washington, D.C.
Today we celebrate the birthday of Augustus Saint-Gaudens, one of the finest Beaux-Arts sculptors working in late 19th-century America. Mr. Saint-Gaudens was born in Dublin, Ireland to a French father and an Irish mother; his family emigrated to America when he was six months old. We say “Happy Birthday” to the sculptor by focusing on a sculpture that some consider his masterpiece and America’s greatest public monument, the Shaw Memorial. “The Shaw Memorial,” detail, plaster, National Gallery of Art, Washington, D.C.
Calls for a memorial honoring the Union Army’s all-black, 54th Massachusetts Infantry Regiment and its commander, Colonel Robert Gould Shaw, began soon after the July 18th 1863 Second Battle of Fort Wagner, where the regiment suffered a crushing defeat. Of the 600 soldiers in the charge on the fort, 281 were killed, wounded or captured. Colonel Shaw himself took a bullet to the chest while going over the wall and died instantly. The 1989 Academy-Award winning film “Glory” tells the story of the 54th. James Caldwell, a grandson of Sojourner Truth, who campaigned for recruits in Michigan, served as a private in the regiment; also, Charles and Lewis Douglass, two sons of the freed slave, social reformer, abolitionist and orator Frederick Douglass, were enlistees. Joshua Benton Smith, an African-American businessman, renewed the interest in a memorial at Boston following the Civil War’s end in 1865. 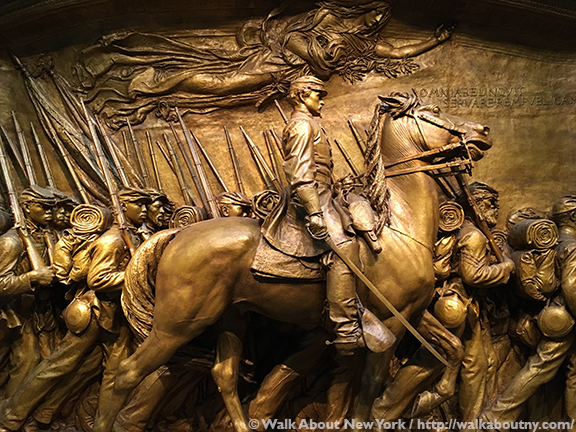 Twenty-one prominent Bostonians formed a committee to erect a memorial; but not until 1883 did Mr. Saint-Gaudens receive the commission for the sculpture, paid for with private funds. 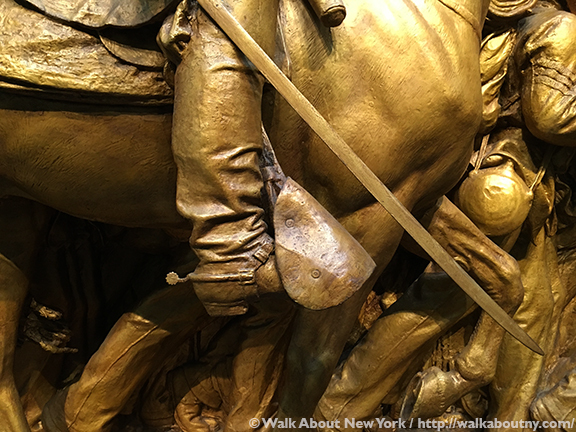 Traditionally military memorial monuments consisted of a single equestrian figure; that is how Mr. Saint-Gaudens first conceived of The Shaw, as it is now informally known. The family of the 25-year-old colonel however was not comfortable with this portrayal, which had historically been reserved for generals. They asked Mr. Saint-Gaudens to reimagine his design. Mr. Saint-Gaudens revised the work, partly inspired by a French painting, Campagne de France 1814 by Jean-Louis Ernest Meissonier, which shows Napoleon on horseback with rows of infantry in the background. 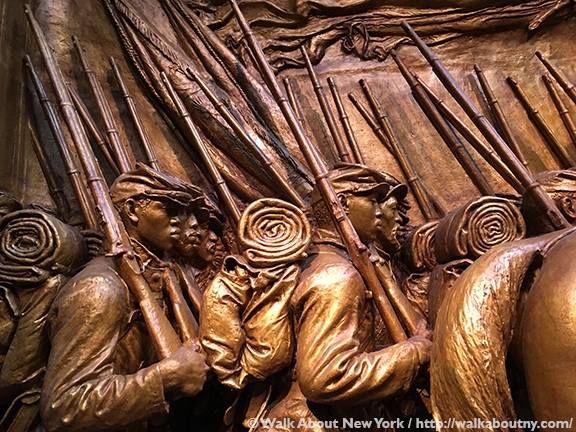 The sculptor reworked his sketch to honor both the regiment’s leader and the soldiers he commanded. This was a revolutionary approach at the time. This relief was the first time a monument depicted blacks as real individuals, and not as stereotypes. The sculptor hired African-American men to pose for 40 different head studies. 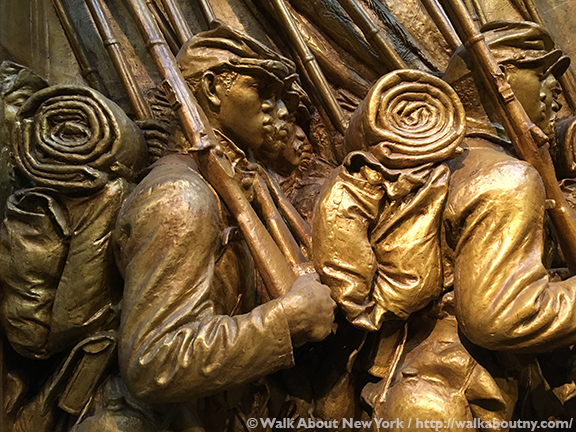 Mr. Saint-Gaudens worked on the memorial for 14 years, the longest he spent on any public commission, producing plaster and bronze versions. Collaborating with the sculptor was noted architect, Stanford White, with whom he had been working from the start of his career. Colonel Shaw’s father suggested using the motto of the Society of the Cincinnati, OMNIA RELINQVIT SERVARE REMPVBLICAM (He forsook all to preserve the public weal). 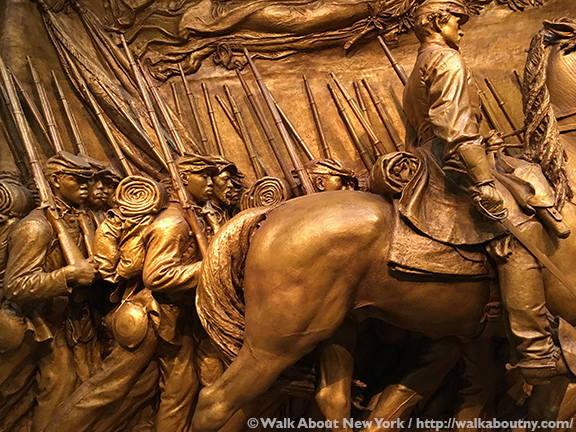 This organization was formed after the War for American Independence for officers and their descendants; Robert Gould Shaw was a hereditary member. In the memorial’s background the motto can be seen. Other symbols include 34 stars arrayed at the top, representing the states of the Union in 1863. Costing $7,000 the bronze measures 11 feet high and 14 feet wide; this high-relief sculpture was cast at the Gorham Company foundry in Providence, R.I., and completed in May, 1897. On the day of the unveiling, May 31, 1897, two huge American flags were draped over the bronze. When a signal was given, two nephews of Colonel Shaw removed the flags. The cheering crowd heard a band strike up “The Battle Hymn of the Republic” and a 17-gun salute was given by an artillery battery on the Common. At the same time, three warships each fired a 21-gun salute in Boston Harbor. 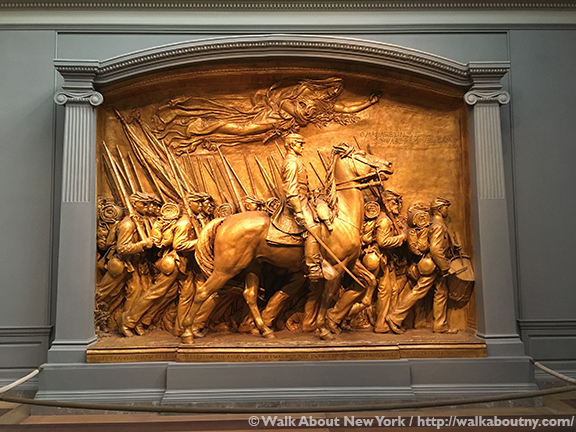 After the memorial’s unveiling Mr. Saint-Gaudens continued to modify the plaster version, changing the horse, the soldiers’ faces, and the angel. His final plaster mold met with great success; it earned the artist the Grand Prize for Sculpture when he entered it as part of the 1900 Universal Exposition at Paris. The patinated plaster artwork was installed at the National Gallery of Art in 1997; it is on long-term loan from the U.S. Department of the Interior, the National Park Service, and the artist’s former workshop/studio, known as the Saint-Gaudens National Historic Site at Cornish, New Hampshire. In 1973 Richard Benson and Lincoln Kirstein published Lay This Laurel, a coffee-table styled book with photographs by Mr. Benson, an essay by Mr. Kirstein, and poems and articles by Emily Dickinson, Frederick Douglass, and Walt Whitman, and others. The authors’ purpose was to call attention to the bronze version of the Shaw Memorial on Boston Common, which had fallen into disrepair. 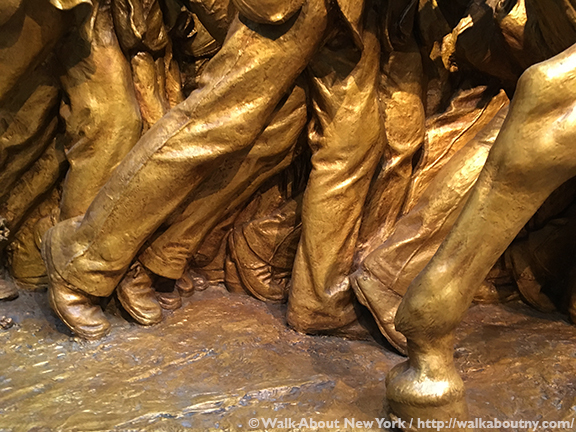 Read our other recently-published article about a sculpture by Augustus Saint-Gaudens, ‘Standing Lincoln’ at The Met. On our Central Park Walking Tour and our Five Squares and a Circle Tour you will discover the artworks of this outstanding sculptor, including his first public commission. Take the Tour; Know More! 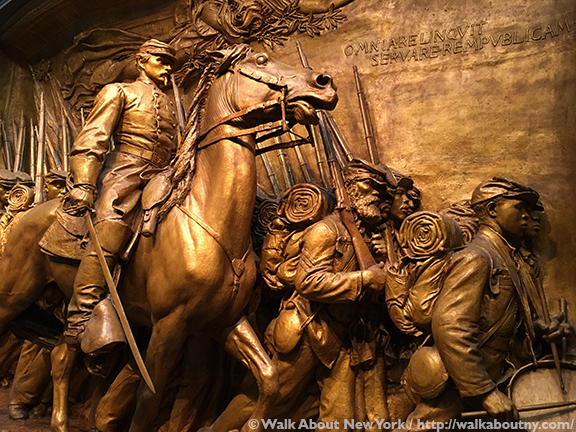 Augustus Saint-Gaudens’ General Sherman Monument, Central Park Walking Tour. 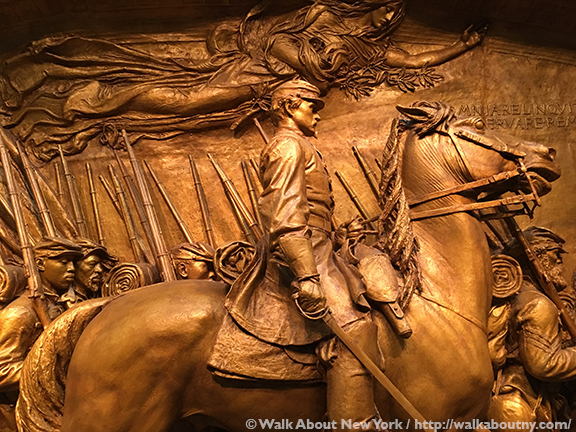 Augustus Saint-Gaudens’ Admiral David Farragut Monument, Five Squares and a Circle Tour.